50th anniversary of the Liberation of Brussels, the carpet was naturally dedicated to the gallant liberators. Thus, the bearings of the two British regiments and the intrepid “Piron Brigade”, the “First Belgian Independent Group”, appeared alongside the arms of Brussels. 1994 was the 50th anniversary of the Liberation of Brussels and the carpet was naturally dedicated to the gallant liberators. Thus, the bearings of the two British regiments and the intrepid “Piron Brigade”, the “First Belgian Independent Group”, appeared alongside the arms of Brussels. An innovation in this 9th event was that three illuminated fountains were set up in the centre line of the carpet – the centre one, 7 metres in diameter, sent coloured jets of water 5 metres into the air. 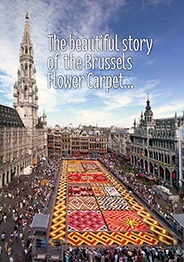 Finally, for the first time in the history of the floral carpet, on 10th August 1994, tow pretty little carpets designed especially children were produced on the lawns of the Parc de Bruxelles. Many enthusiastic children, directed by organisers, took part in illustrating two scenes from the Disney Studios’ “Aristocats”.